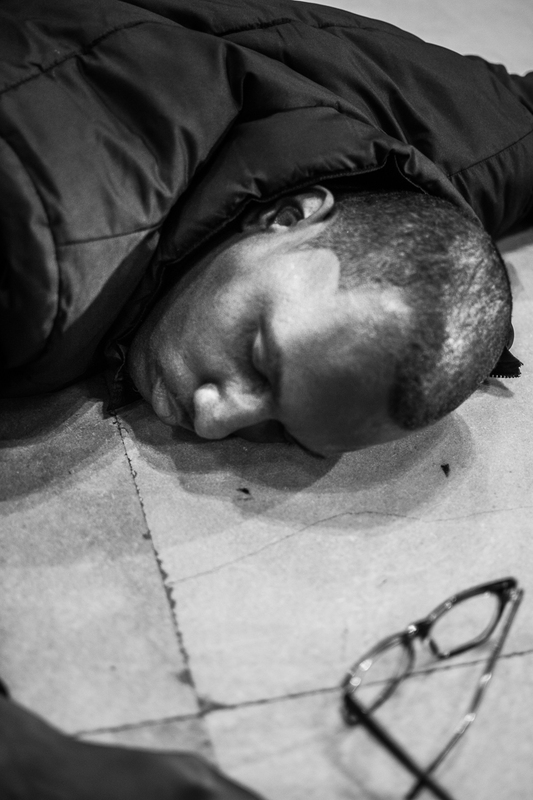 Hundreds of demonstrators surreptitiously descended on Amtrak’s 30th Street Station yesterday afternoon to participate in a ‘die-in’, quietly laying down en masse for four minutes and thirty seconds to symbolically memorialize the length of time – four hours and thirty minutes – slain teen Michael Brown remained in the street after being murdered by Officer Darren Wilson in August. The event was met with an extremely heavy police presence that encircled the demonstrators as the rush-hour crowd watched. Organizers planned the action to show “solidarity with our brother and sisters in Ferguson, and in opposition to the ongoing genocide perpetuated against Black people in the United States,” according to a statement released by the group In Defense of Black Bodies. As a Staten Island grand jury handed down their decision not to indict New York Police Department officer Daniel Pantaleo, who murdered unarmed father of six, Eric Garner, during an encounter in August, emotions were running high among demonstrators. At approximately 4:20 pm, protesters began their march from the station, and in a tense moment resulting in scuffles with police attempted to take I-676, before continuing to City Hall, where the city’s annual tree lighting ceremony was scheduled to take place. Demonstrators proceeded down Market Street to disrupt the event, chanting over on-stage performers as ceremony planners increased the volume in an attempt to drown out emotional chants such as “I can’t breathe! I can’t breathe!”, a reference to the final words Garner uttered while being choked to death by Officer Pantaleo. Demonstrators remained in the courtyard until the actual lighting, and then locked arms around the tree. One man, 25 year old Ian McShane, was arrested after attempting to jump the Christmas tree’s barricade and unplug the lights, according to police. He is charged with disorderly conduct. 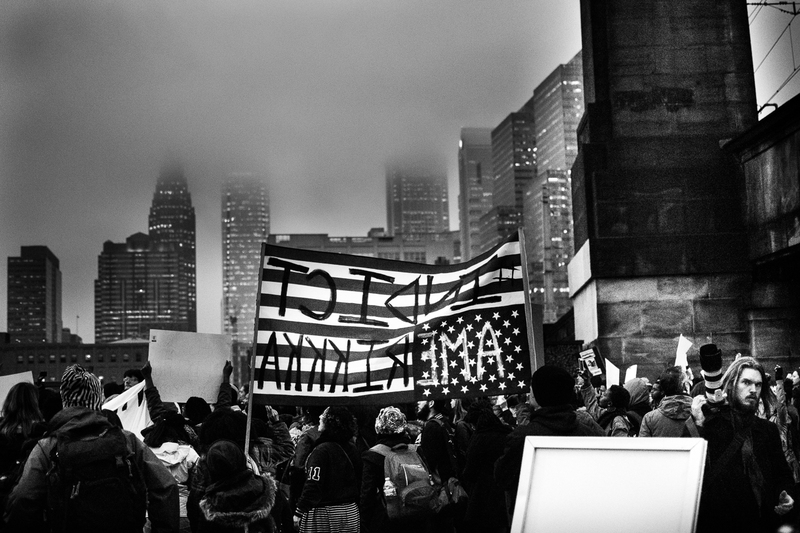 Protests are expected to continue in Philadelphia and nationwide in the wake of the Ferguson and Staten Island grand jury decisions. 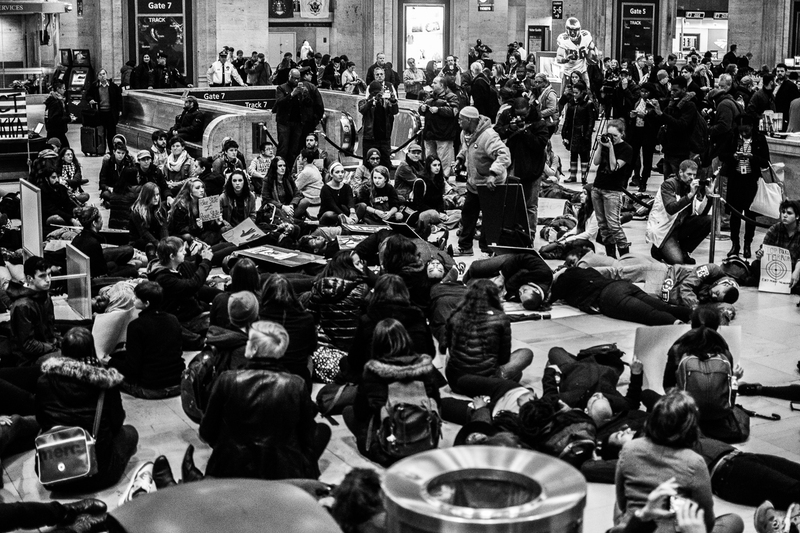 Editor’s note: The ‘die-in’ video in this post was generously provided by Suzy Subways, an editor at Prison Health News, coordinator of the SLAM! Herstory Project, a fiction writer, and a graduate of the Philly public school system.